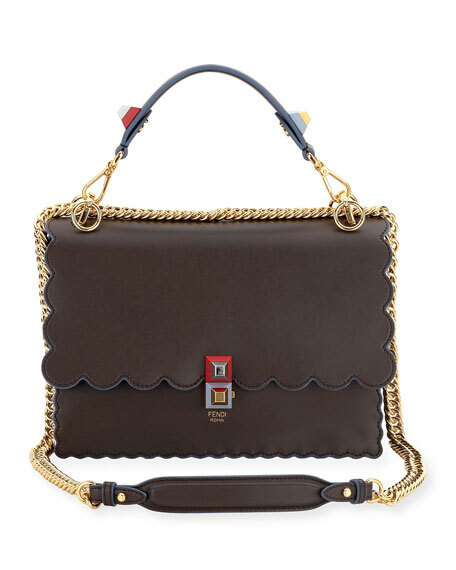 Fendi calf leather shoulder bag with scalloped trim. Flat top handle with ABS studs. Flap top with ABS stud push-lock clasp. Interior, suede lining; one slip pocket. Approx. 7.3"H x 9.8"W x 4.3"D.
Bottega Veneta bucket bag in signature intrecciato woven lambskin. Brunito brass hardware. Flat top handles, 3.3" drop. Open top with magnetic closure. Interior, suede lining; one zip and two slip pockets. 8"H x 9.6"W x 4"D; weighs 1 lb. 2.8 oz. Made in Italy. kate spade new york shoulder bag in metallic flower-printed fabric. Removable, adjustable shoulder strap, 23" drop. 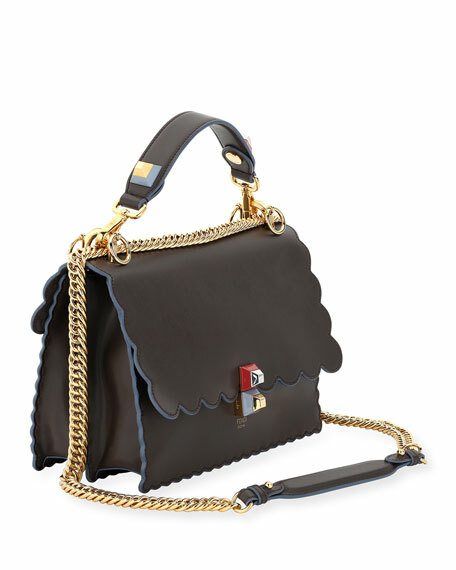 Flap top with crystal and pearly buckle; push-lock closure. Interior, satin lining; one zip pocket. 5.4"H x 6.6"H x 2.4"D. "madison knollwood drive" is imported.